The two most important recent waves, SaaS and mobile are cresting and a new AI-driven wave is rising. Technology development follows a recurring pattern, the S curve. It does this in a fractal pattern, with large technology revolutions being composed of smaller waves that follow the same pattern. Two of those smaller waves, SaaS (software as a service or the replacement of on premise purchased applications with internet-delivered rental applications) and mobile (replacing computers as the primary interface for applications) are entering the tail of the curve and a new wave is becoming visible. It can be useful to think about the new wave that is emerging as being made up of systems of intelligence. The SaaS and mobile sub-waves that have driven business software for the past number of years are now 18 and 101 years old respectively. They are now well into what noted researcher and author Carlotta Perez calls the deployment phase. 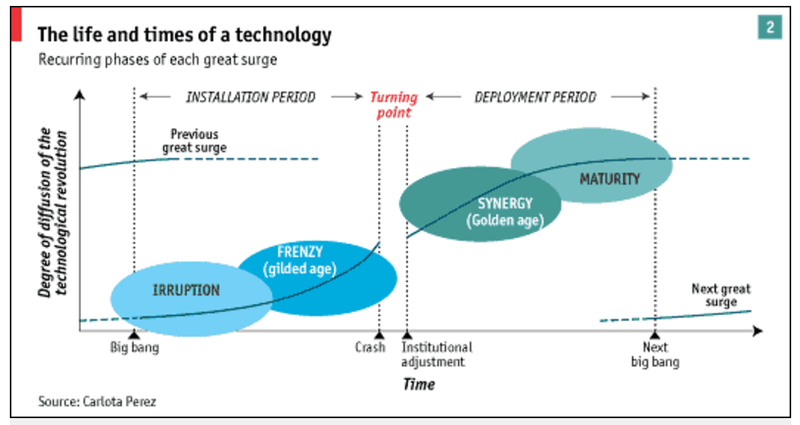 Perez describes all major technology changes as going through two main phases: installation, where infrastructure is rapidly deployed (think about the building of networks, servers and cell towers in the 90’s and 00s), followed by a crash; and then a recover into the deployment phase, where the action shifts to applications of the technology. There is still incredible value to be unlocked as enterprises complete the SaaS and mobile transitions and adapt their business models to take advantage of them. But for those of us who aim, however imperfectly, to look into the future, some of the waves that are coming next are becoming clear. For those of us who aim, however imperfectly, to look into the future, some of the waves that are coming next are becoming clear. One of those waves is systems of intelligence – a new layer of artificial intelligence-powered applications that sits between the systems of record and the systems of engagement. There have long been applications that fill gaps in the systems of record – reporting tools or marketing automation – and aim to connect the systems of record (think middleware or master data management). Systems of intelligence, however, are different in important ways. A system of intelligence mixes newly practical AI capabilities’ notably deep learning with the huge volumes of data that have become available and manipulate-able in the last few years (often called Big Data), and combines these with workflow to create novel new applications. As these systems are still relatively new, the most widespread of them aim to automate well-defined routine tasks. Appzen uses a system of intelligence to check expense reports for compliance. Zoom.ai uses AI to co-ordinate meetings. Ada Support provides AI-powered front line customer support. These applications are about assisting enterprises in doing things they can already do, but doing them faster and cheaper than ever before. More advanced applications aim to give enterprises entirely new capabilities by augmenting human capabilities. BenchSci analyzes millions of scientific journal articles to make researchers more efficient. Amity watches how people use a software application to predict when they need help. Nudge.ai analyzes business emails as you write them and offers tips to make them more engaging. The most advanced projects aim to build completely autonomous systems – applications that act on their own to solve enterprise problems. Most of these are still in the development stage, but one live example is Sentient Technologies, an autonomous AI-powered investment fund. At T4G, we’ve worked with Enbridge to develop a system of intelligence that increased the efficiency of its wind farm business. The system is fed mountains of historical data which it distills into insights and dashboards that let Enbridge predict and avoid many of the demand generation and maintenance issues they previously faced. This innovative solution dramatically contributed to wind farm up-time, increasing the overall efficiency of renewal wind energy. Enbridge saw a 200% increase in divisional profitability without any new physical investment. They could also accurately estimate market price and revenue attainment, and experienced a dramatic increase in load forecasting accuracy. Systems of intelligence are spreading quickly, driven by increasingly accessible AI and ever growing volumes of data. Now, companies looking to take advantage of them should be well along the path of automating routine activities for efficiency, actively experimenting with augmenting their people with AI “super powers” and thinking strategically about how truly autonomous systems can transform their industries. 1. Considering SaaS as starting with Salesforce.com in 1999 and mobile as really beginning for enterprise applications with the iPhone in 2007.